Dividend stocks have been popular with bond yields low, but with a Fed rate hike looming some classic dividend payers could take a hit. The S&P 500 plunged 2.5% Friday, its biggest single-day drop since the Brexit vote. The culprit? A simple murmur about the Federal Reserve raising interest rates from Boston Fed President Eric Rosengren. Stocks fell across the board, but normally stable high-yielding dividend payers got hit the hardest. AT&T (NYSE:T) dropped 3.6% and Verizon (NYSE:VZ) shed 3.3%. Utilities fell 3.8%. Under normal circumstances, dividend stocks tend to outperform the market in a pullback as they are generally defensive companies that offer income even in a down economy and have stable businesses that can generate solid profits. Recently, however, the biggest threat to the stock market hasn't been an economic slowdown, but the possibility that the Fed will raise interest rates. Stocks have thrived since the recession in part because of the central bank's decision to keep borrowing rates near zero. That has kept bond yields low, making dividend stocks a preferable option for income investors. Low interest rates have also encouraged heavy borrowing to fund the share buybacks favored by such dividend stocks. In this sort of environment, it's not surprising to see dividend stocks flinching every time a Fed president mentions rate hikes. Valuations aren't always easy to interpret, but since the economy recovered from the recession, the S&P 500's price-earnings ratio has steadily climbed, fueled by the Fed's easy money policy. Today, the broad-based index trades at a P/E of 24.6, nearly 60% above its historical average of 15.6. In other words, investors are paying nearly 60% more than they usually do for $1 worth of earnings. Only two other times in the last 100 years has the market's valuation been this high. One was during the financial crisis when profits tumbled, temporarily inflating valuations, and the other was during the late 1990s tech boom when stocks soared as high-valued tech IPOs rushed onto the market. For individual stocks, a high P/E ratio is associated with faster growth, but that isn't true for today's market. In fact, as of the first quarter of this year, S&P 500 earnings had fallen six consecutive quarters due to the collapse in oil prices and the stronger dollar. Nonetheless, stocks have posted modest gains during that time. What's a dividend investor to do? 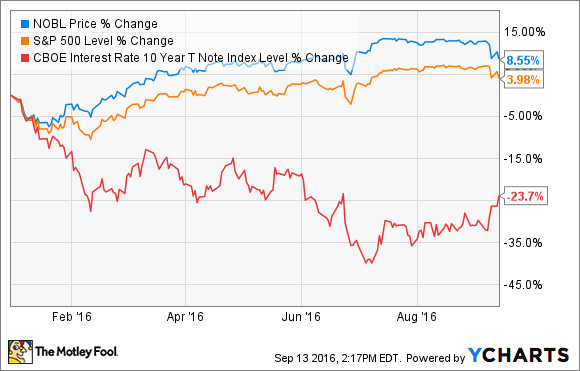 The relationship between dividend stocks and interest rates seems evident. As the chart below shows, the ProShares S&P 500 Aristocrats ETF, which is made up of stocks that have raised their dividends annually for at least 25 years, has outperformed the S&P 500 during times when treasury rates have fallen this year. However, not all dividend stocks are created the same. Safer stocks like consumer staples, telecoms, and utilities will likely do worse when the Fed starts to raise rates. These are stocks that investors favor for their high dividend yields and ability to withstand recessions. For instance, stocks of foodmakers like General Mills (NYSE:GIS) have been bid up recently, even though these companies have not been able to deliver much earnings growth. Investors have flocked to the cereal maker because of its 3% dividend yield, but EPS growth has been limited. Still, the stock has moved higher as investors chase yields. Some dividend stocks do tend to be winners in a rate-increasing environment, however. Banks benefit from rising rates as they allow them to increase their net interest margin, or the profit they make on the spread between deposits and loans. Because rate hikes tend to come while the economy is expanding, cyclical stocks like autos could also be winners in such an environment. Stocks like General Motors (NYSE:GM) and JPMorgan Chase (NYSE:JPM) offer solid dividend yields, but have not been bid up in the way that safer dividend stocks have. We know the Fed will eventually raise interest rates. We don't when, but Friday's sell-off should serve as notice to dividend investors. If you're heavily invested in sectors like utilities, telecoms, and consumer staples, now might be a good time to rebalance.